Nicknamed the “Alien Half” thanks to its nighttime running and the glow-in-the-dark gear organizers plan to hand out before the start, Roswell’s Area 13.1 Half Marathon is set to make its 7th annual running during an early-evening run with plenty of shade, through one of the metro Atlanta area’s most popular parks. The race is set to take runners through portions of the Chattahoochee River National Recreation Area and Morgan Falls Reservoir, along a combination of park trails and roadways that run alongside the Chattahoochee, which flows into and through nearby Atlanta from this smaller suburb that’s home to some 88,000 residents of its own. Organized by the locally-based running store chain Big Peach Running Company, the race is scheduled just as the sun is going down and the possibilities for an “alien invasion” are on the rise. Runners will start the out-and-back course for the race at Roswell’s Riverside Park, which lies just off Riverside Road and South Atlanta Street, near the Georgia 400 exit. From there, runners head first east along the trails that parallel the river, and then join Riverside Road (which becomes Riverside Drive) all the way down to the first turnaround point, which lies between the mile 3 and mile 4 markers. After the turn, the course then heads back up the river along the route runners just covered, back in the direction of Riverside Park. 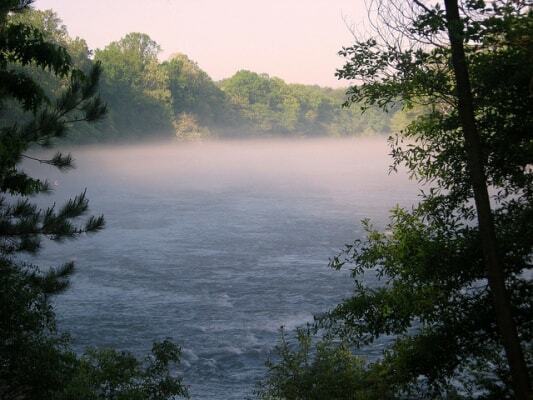 This stretch of the race takes runners through the Chattahoochee River National Recreation Area, which is part of the National Park System and is made up of a series of smaller parks along the river throughout the metro Atlanta area, stretching from just north of Buckhead all the way up nearly all the way to Lake Lanier. Once they’re past the starting line, runners then head west along Azalea Drive and Willeo Road to the race’s second turnaround point, which this time lies between the mile 9 and mile 10 markers. After that, the course brings runners back along the river to the park where they started, where all the runners’ glow-in-the-dark gear (organizers plan to hand out bracelets that glow as well as specially made race t-shirts that will glow in the dark) will no doubt be lighting up the finish line area. Organizers also add that the course is “very flat and fast,” and should offer an excellent opportunity to achieve personal record times. Proceeds from the race will go to benefit a Bwanali Chipole Victory, a nonprofit organization that is building an orphanage in Malawi, Africa to house 150 young girls and has been serving the children and community of Malawi since 2011. Located in central northern Georgia, about 20 miles north of downtown Atlanta, Roswell typically sees August temperatures that average between 66°F and 86°F, while rainfall totals average just over 4.3 inches, making August the city’s fourth-wettest month of the year. On race day (Aug. 17), the average low is 70°F and the average high is 88°F. See the race route map for the Area 13.1 Half Marathon here. To reserve your spot in the summer 2019 running of Roswell’s Area 13.1 Half Marathon race or 5K, register online at RunSignUp.com here. Ever run in the Alien Half? Share your impressions here, or post your review in the Comments box below. Is this a chipped race or not. Also is this a trail running race? 2 questions – in one place is says the race starts at 7PM, in another is says 5:30 so, when does it really start? I the course all on pavement or are there woody trails in the mix? Hi Randy — great question and sorry for the confusion. The race begins at 7:00 PM, and it is run on a combination of paved trails, dirt trails and paved roads.